Helium Music Manager is a software that’s so simple to navigate anyone can use it, yet it’s so feature rich that it allows you to take complete and total control of all of the audio on your computer with only one program. With this tool, you can import and update your libraries, rip CDs, edit file tags, and so much more! If you’re someone that loves listening to music and you happen to have a ton of it hanging around on your system, you’re definitely going to want to have Helium Music Manager to help you organize it to your unique needs. - A clean and intuitive interface that can be utilized by anyone with a basic knowledge of how software works. 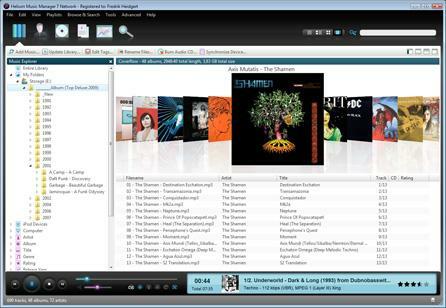 - Allows you to add files to your library and rip CDs quickly and effortlessly. - Lets you import and update your library whenever you want without having to set aside hours to do so. - Gives you the opportunity to check out the name, artist, title, album, year, and rating of any given audio file in your track list. - Allows you to easily edit file tags (or alternatively copy filenames to tags). - Lets you set the rating, release type, quality, and popularity of your various tracks. - Allows you to create a favourites list. - Enables the backup and restoration of your databases for ultimate safety. - 1024 MB (1 GB) RAM (2 GB recommended). - Microsoft .NET Framework 4.0 (version 4.5 recommended).